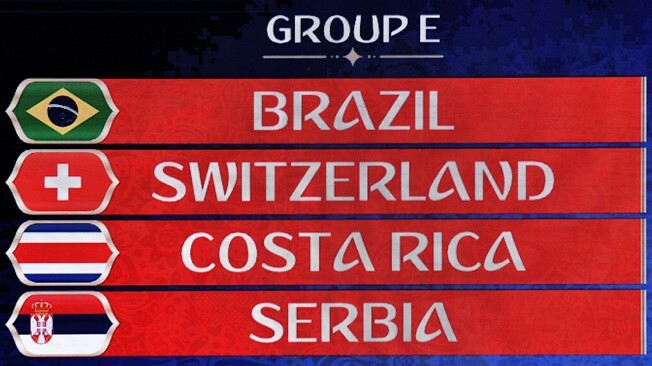 Check out confirmed details about Group E Teams, Schedule, Predictions for the upcoming 2018 FIFA World Cup in Russia. Playing for the record 21 times, Brazil was the first team to qualify for the world cup. After recovering from the humiliating 7 – 1 loss from Germany in 2014 in the home ground, Brazil currently stands at second rank in world football. Switzerland has not advanced into quarter finals since 1962. They crashed out of 2014 world cup in round of 16 when Argentina defeated them one goal to nil. Making their fifth appearance in the world cup, Costa Rica surprised everyone when they qualified from the group of Uruguay, Italy and England to further quarter finals by defeating Greece in round of 16 in 2014 world cup. But can they do it once again this time? After missing out the 2014 world cup and the 2016 European championship, Serbia made a strong run in qualifying campaign to reach the world cup. Their best performance was in 1962 when they were defeated for third position. Five-times champions Brazil will be heavy favourites to win the group, leaving Switzerland, Costa Rica and Serbia in a battle to join them in the knockouts. Brazil had a dream run in the qualifying campaign when they became the first team to qualify for the world cup by losing just a single game and having 10 points difference between the second spot Uruguay. Brazil scored 41 goals in 18 games. Advancing to the world cup by second round, Switzerland defeated Northern Ireland and only a game in the qualifying stage. They also defeated European champions Portugal in their qualifying group. They are favourite to qualify to round of 16. Costa Rica won 4 games out of 10 in the fifth round of qualifying stage. They were second runner ups in 2017 CONCACAF championship. But still what can haunt Switzerland is when they defeated Uruguay and Italy in 2014. They pose a major threat ahead of Switzerland’s journey. After failing to qualify for 2016 European championship, Serbia qualified after topping the qualifying group of Republic of Ireland and Wales. But they still have lot of work to do to match the odds of Brazil and Switzerland. Don't forget to watch 2018 world cup live online from June 14.